The Robert Burns Birthplace Museum is made up of six sites within the village of Alloway (within the town of Ayr), all within easy reach of each other and offers a truly unique insight into Scotland’s favourite son. 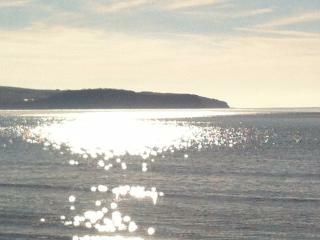 Culzean Castle is only 12 miles South of Ayr – taking either the A719 beautiful coastal road or the A77 via Maybole. 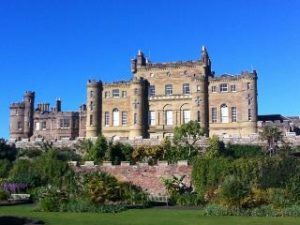 Culzean Castle has a dramatic clifftop setting, Robert Adam architecture, fascinating history and beautiful surroundings and is one of Scotland’s most popular visitor attractions. It is surrounded by Culzean Country Park, an extensive estate encompassing lush woodland, landscaped gardens and rugged coastline. This 18th-century Scottish castle couldn’t be better placed for a family day out. You could easily spend an entire day exploring the country park alone, but with so many treasure-filled rooms to see inside the castle, it’s well worth making time to enjoy both elements of this magnificent historic attraction. Younger visitors will enjoy discovering the amazing adventure play park – Adventure Cove where they can climb, swing and explore Archibald the Wicked’s Dungeon, the hidden smugglers’ caves, play in the boats on the beach, climb up the Eisenhower tower and see it all from the height of the viaduct – then see the places for real as they explore Culzean. Heads of Ayr Farm Park and undercover Play N’Wild adventure barn is only 4 miles South of Ayr on the A719 coastal road and whatever the weather there is always something to do there! There are plenty of exciting activities for all the family – Captain you own boat with their amazing bumper boats, soak your family and friends in water wars, try out the electric tractors and diggers, there is even have an assault course, playpark, giant sand pit, trampolines, ringo sledging, a giant aerial runway and jumping pillows to keep you amused! Quad biking is always great fun and they have quads for all ages – small electric quads which adults and children can go on together, kid’s quad bikes for children aged 7 -11 and adult quads for visitors who are over the age of 12 and over 5 feet tall. The undercover Play N’ Wild adventure barn is has three giant drop slides and a two storey soft play area suitable for all ages – there is also a coffee bar ‘Scallywags’ in the play n’ wild barn offering delicious coffee, sandwiches and cakes and ‘Roosters’ Restaurant selling a variety of hot and cold food and drink. As well as all the fun activities there are many different animals for you to meet and learn all about – visit the Little Critters Animal Barn to see lots of the smaller animals such as rabbits, guinea pigs, degus, mice and birds or venture outside into the new animal zone and see many of the larger residents including Ralph the Camel, Troy the Tapir, llamas, ponies, donkeys and goats. The Park is also home to various breeds of monkeys, lemurs and meerkats! Copyright © 2019 Leisure Scotland. Powered by WordPress. Theme: Accelerate by ThemeGrill.